While working as a Close Protection Officer you should carry out a search of all vehicles prior to using them. This search will be carried out whether or not the vehicle has been left unattended; however, if a vehicle has been left unattended then the search will be much more thoroughly and cautiously carried out. Essentially, there are two types of search cursory and full systematic. The cursory search should be carried out every time you enter the vehicle. This is nothing more than a scan of the vehicle’s surrounding area. 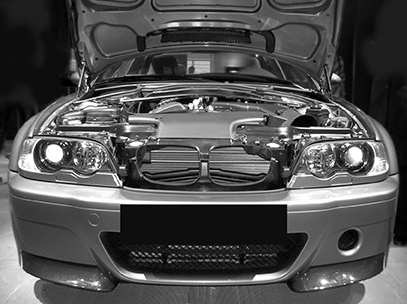 You should examine the underside (which is best viewed from a distance), the wheel arches (which must be searched from a close point), along with the locks and windows to look for any evidence of tampering. Cursory searches are quick once you are experienced and can often be done with such a casual low profile hardly anyone will notice what you are doing. The full systematic search is a completely different matter: this is a thorough and methodical search that takes time and manpower. It is normally carried out only when the vehicle has been out of our care and control, e.g. away for servicing, or if it’s a new car. We are searching for any signs of tampering such as brake or fuel lines cut. The result of faulty brakes is obvious. A cut fuel line would make us break down as part of some kind of attack or robbery. A small amount of explosives could kill all of the occupants, a bug could transmit all of the occupant’s conversations, and a small transmitter could give away the exact location of the vehicle at all times. Your full systematic search should take all of this into account. A mirror is an excellent tool for searching a vehicle. Do not keep your search kit in the boot of the car! Pocket mirrors are a good idea. A mirror without a light source shining on it is next to useless. The search must be broken down into stages and each stage completed in order. This might be for example, the car park or garage, the immediate area around the car, drains, freshly cultivated areas, hedges, culverts or dustbins. You are looking for wires, anything unusual at all. A bomb does not have to be in the car to kill or injure the vehicle’s occupants. Pay attention to the paintwork, chrome, mirrors, bumpers, hubcaps, windows, filler cap and number plates. You are looking for any signs of tampering, forced entry, fingerprints and smudge marks, etc. 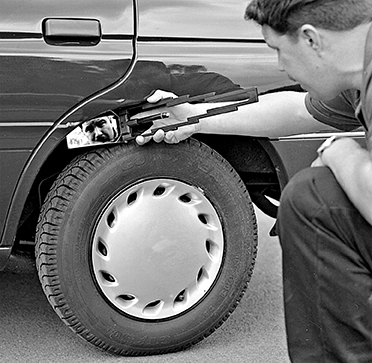 Check for cuts in tyres and brake pipes and ensure that no sharp objects have been inserted into the tyre. Make sure that wheel nuts have not been loosened. Also check inside the whole of the wheel arch; while doing so, make sure you look but don’t touch because if a device was placed on the wheel, you could easily knock it off while feeling for it. Remember that bombs don’t kill you but explosions do, so don’t cause an explosion! Check the whole of the chassis, prop shaft, engine compartment, the whole length of the exhaust pipes, and the check inside the wheel area. Just underneath the sills is the common area for attaching small, improvised explosive devices; they can be attached by strong magnets. A small box half the size of this book, painted black and covered in road dirt could be hidden under a car and be overlooked if you don’t know what the underneath of the vehicle looks like. You must be familiar so that little bit of box section that shouldn’t be there is noticed! Remove all items from the boot, check all of the boot area, and check the spare for serviceability. Open all doors after carefully observing through the windows for anything suspicious. Leave the doors open before conducting a thorough search of the whole interior. Start by searching the driver’s seat, headrest and arm rests. Then you will be able to sit and kneel on this seat while you start to search the rest of the interior. The interior will take longer than you might imagine as there are many places that bugs or bombs can be hidden. Be systematic and methodical. Search everywhere, including the roof, floor, sides, front and rear. Check the release catch and then proceed with a full search of the whole engine compartment. If you are unfamiliar with the engine compartment then you will find it almost impossible to know whether something is a regular component or a bomb! Some operators take a digital photo of the engine compartment so they can refer back to it. Essentially if you check it properly and often enough, you will soon notice if something is not right. Only once the search of the engine compartment is complete should you turn your attention to the fluids and lubricant levels to check they are normal. Leaving the doors open, start the engine, check all electrical equipment (lights, wipers, etc). Check gears, brakes and listen to the engine sound. Is it ok? Close the doors and drive, check the steering and the brakes. How does the engine sound? Are there any warning lights such as oil or ABS? What is the fuel state? If you find anything at all suspicious, do not touch. MOVE IN THE GENERAL DIRECTION OF “AWAY” Use the 4Cs. (See chapter on Bomb Awareness). Beware the Close Protection book or training course that has you searching vehicles using hooks and lines to open the doors and the bonnet/hood from a safe distance. If you are so certain that there might be a bomb in the car that you are not prepared to open a door without being 50 yards away behind a wall, then call the bomb squad and let them remotely open the doors! Make things easier for yourself. Vehicles should never be left unattended but if this is impractical then they should only ever be parked in secure places. If the vehicle is left in an insecure environment, even for the shortest time, then a full systematic search must be carried out as soon as possible. Someone could attach a bumper-beeper (tracker) in seconds. Similarly, if a person had an illegitimate set of keys they could plant an effective bug or bomb inside the car in less than 45 seconds. You can make your searches quicker by using seals; if you use a unique seal to lock the vehicle’s toolbox, just a glance will tell you if it has been tampered with. The same seals can be used on spare wheel storage areas. A subtle blob of paint or Tippex on screw heads will tell you immediately if a screwdriver has been used on them. These are systems that will monitor the underside of the vehicle. They are fitted to the vehicle, look for magnets that might be attached and also monitor the noise signature of the vehicle. A bomb attached to the car by any means will disrupt this signature and the alarm will activate. These systems are able to text or page you when they activate. Remember that even the most sophisticated under-car bomb detector will not let you know about the bomb that is near or next to the car! You must be familiar with your vehicle to have any chance of finding a transmitter or a bomb. If you know what it looks like, you may notice something out of place. Systematic searches take time and you should strive to avoid them at all costs. Avoid unattended parking whenever you can, but if you must leave the car then a manned car park is better than an unmanned one, and a car park with CCTV cameras everywhere must be better than one with none at all. Park near the attendant if there is one and avoid the quiet areas that are not overlooked, areas where someone could go to work on your car. Always carry out cursory searches and ensure that your systematic searches are methodical. Always get alarms fitted and if the threat warrants it then you should persuade the Principal to fit an under vehicle bomb detector.